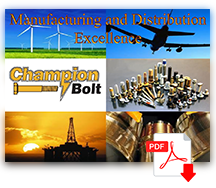 Inspection / Quality Control - Champion Bolt, Inc.
Every part coming into Champion Bolt is inspected to your drawing or consensus standard per specified inspection levels. Our rigorous quality management system is based on the ISO standard. Our process quickly filters out any incoming supplier issues. Parts reach your location - correct and on-time. Production part approval program (PPAP).